Vanderbilt’s Center for Medicine, Health, and Society (MHS), The Rymer Gallery, and Parnassus Books are pleased to announce Talking Across Social and Political Divides in Trump’s America, a conversation with Dr. Jonathan Metzl, Director of the Safe Tennessee Project Beth Joslin Roth, Professor Larry Isaac (Vanderbilt Chair of Sociology), and Professor Tracy Sharpley-Whiting (Vanderbilt Chair of AADS) about the politics of racial resentment its impact on public health, on Tuesday, March 12 from 6:00-8:30 pm. 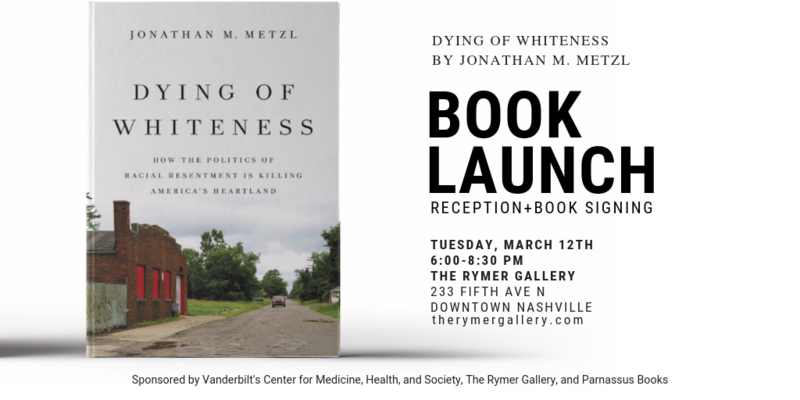 The event will also mark the launch of Dr. Metzl’s new book Dying of Whiteness (Basic Books, 2019), and will be followed by a reception and book signing. With the rise of the Tea Party and the election of Donald Trump, many middle- and lower-income white Americans threw their support behind conservative politicians who pledged to make life great again for people like them. But as Dying of Whiteness shows, the policies that result actually place white Americans at ever-greater risk of sickness and death—and in the end, threaten everyone’s well-being as well. Physician Jonathan M. Metzl’s quest to understand the health implications of “backlash governance” leads him across America’s heartland. Interviewing a range of Americans, he uncovers how racial anxieties led to the repeal of gun control laws in Missouri, stymied the Affordable Care Act in Tennessee, and fueled massive cuts to schools and social services in Kansas. Although such measures promised to restore greatness to white America, Dr. Metzl’s systematic analysis of health data dramatically reveals they did just the opposite: these policies made life sicker, harder, and shorter in the very populations they purported to aid. Thus, white gun suicides soared, life expectancies fell, and school dropout rates rose. Right-wing backlash policies had mortal consequences — even for the white voters they promise to help. Powerful, searing, and sobering, Dying of Whiteness ultimately demonstrates just how much white America would benefit by emphasizing cooperation, rather than by chasing false promises of supremacy. White Americans, Dr. Metzl argues, must reject the racial hierarchies that promise to aid them but in fact lead our nation to demise. For more information please visit dyingofwhiteness.com. Open to one and all!